Punters love blackjack because it once offered the lowest house edge of all casino games. While that may no longer be the case at land-based gambling venues, the best real money blackjack sites carry numerous online 21 games that boast far better odds than you will find at any Australian casino. The safe casino sites above run dozens of virtual blackjack variants from top software providers such as Betsoft, Microgaming and Net Entertainment, as well as high-quality live dealer 21 from the likes of Evolution Gaming, Extreme Live Gaming and Ezugi. These game suppliers are among the very best in the business, so you can be assured of a fair, secure and authentic online gambling experience. Follow the links below to try out the best online blackjack games for free, with no downloads or registration required. 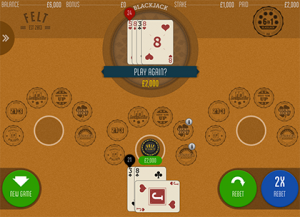 You can even play real mobile blackjack games via the web browser on your smartphone or tablet device. If you like what you see, you can then register for real money play and take advantage of the exclusive welcome bonuses, AUD deposit matches and weekly casino promotions available to readers of BestOnlineCasinos.net.au. Simply put, the term ‘house edge’ refers to the casino’s mathematical and theoretical advantage over the player in any given game. It is calculated by purpose-built computer programs that simulate thousands upon millions of hands to determine how a game’s rules and betting options affect the probability of winning or losing and the expected returns over time when using proper strategy. All casino games favour the house to some degree (with the exception of some older video poker machines), but the odds in 21 have always been far more player-friendly than most other forms of gambling. Even at land-based casinos in Australia, where operators are bending the rules ever further in their favour in a bid to protect their profit margins, blackjack and pontoon remain better bets than the majority of other table games. For example, a standard Australian blackjack game might have a house edge of around 0.60 per cent. That means for every $100 you bet, you can expect to lose about 60 cents on average in the long run. By way of comparison, every wager in European roulette favours the casino by 2.70 per cent – an expected loss exactly 4.5 times greater. It’s even worse in American roulette, where the double-zero layout bumps the house advantage up to 5.26 per cent. Microgaming Gold Series – Long considered the high watermark for digital online casino games, the Microgaming Gold Series blackjack collection matches superior graphics and performance with some of the best odds in the business. No fewer than eight Gold Series 21 games have a house edge lower than 0.40 per cent, including top titles such as Atlantic City Blackjack, Spanish Blackjack and Vegas Strip Blackjack. The pick of the bunch, however, is Classic Blackjack Gold, which returns as high as 99.91 per cent with perfect strategy. Felt 6 in 1 Blackjack – Established in 2013, Felt Gaming is fast establishing itself is a first-class developer of real cash blackjack games for internet casinos. The company’s portfolio features a wide variety of popular side bets such as 21+3, Buster Blackjack, Lucky Ladies, Lucky Lucky, Perfect Pairs and Suit ‘Em Up – all of which are available in Felt’s 6 in 1 Blackjack flagship title. While blackjack side bets are never great value, a base game house edge of 0.37 per cent certainly is. Betsoft Single Deck – Simple, elegant and affordable, Betsoft’s online casino games are a popular choice for both newbies learning the ropes and seasoned players who favour reliability, performance and value over slick visuals and other such bells and whistles. Single Deck Blackjack is a prime example, offering a straightforward set of rules with a $100 bet limit and only 52 cards in play. Stick to basic blackjack strategy for a very reasonable house edge of 0.37 per cent. NetEnt Pro Series – Most of the best instant play casinos carry the Net Entertainment Professional Series of real money table games, which features three low-edge variants of digital 21: Blackjack Pro (0.40 per cent), Pontoon Pro (0.41 per cent) and Blackjack Single Deck Pro (0.48 per cent). The NetEnt Pro casino games are famous for offering selectable table limits that cater to low, medium and high stakes blackjack players alike, while some AUD casino sites also offer special VIP limits that allow you to bet upwards of $4000 per hand. Evolution VIP Blackjack – Nobody does live dealer blackjack better than Evolution Gaming. 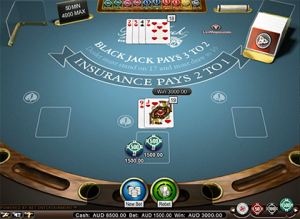 Besides featuring superior HD video quality, charming professional croupiers and a wide variety of betting limits, Evolution’s live blackjack games also offer great value for money – especially the VIP Blackjack Live series, where a 0.49 per cent house edge kicks the arse off most land-based 21 games at Aussie casinos. Best of all, we can enjoy these industry-leading live 21 games on iPhone, iPad and Android at Evolution’s state-of-the-art mobile live dealer casino. There is absolutely no point scouring the web for the lowest house edge blackjack games if you don’t understand basic strategy. The computer simulations that calculate the probabilities and theoretical returns in 21 are all based on optimal strategic play, so any deviation from that renders the house edge irrelevant and greatly reduces a player’s chance of success. Fear not, because blackjack strategy is much simpler than it appears at first glance. You don’t need to learn how to count cards – an entirely useless endeavour at secure online casinos – and a quick Google search will turn up a host of free blackjack charts and reliable strategy calculators. 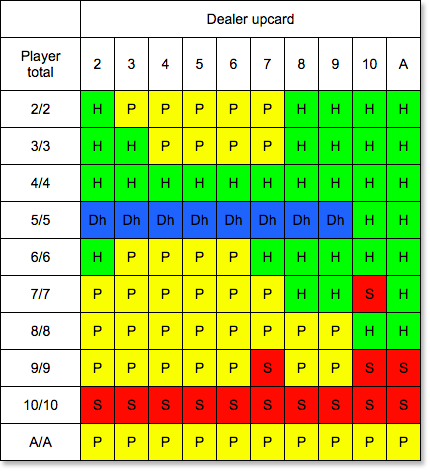 Not one strategy fits all, as the rules of blackjack are endlessly variable, so it is important to make sure you have the correct strategy chart for your game of choice. Below is the basic strategy for Microgaming Classic Blackjack Gold. 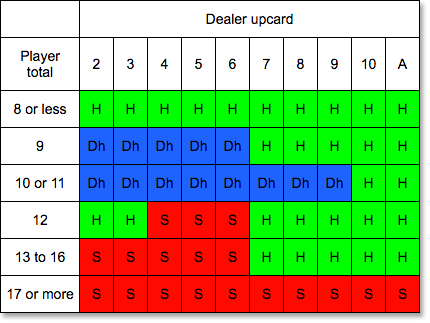 To figure out if you should hit, stand, split, double down, or surrender, find your initial hand or total points value on the left-hand menu and compare it against the dealer’s upcard. With these simple moves, the house edge comes to a mere 0.13 per cent – unmatchable value. Play virtual blackjack and live dealer 21 for real money with Australian dollars at Guts.com – our number one desktop and mobile casino. Sign up today and score a 200% cash bonus on your first deposit.